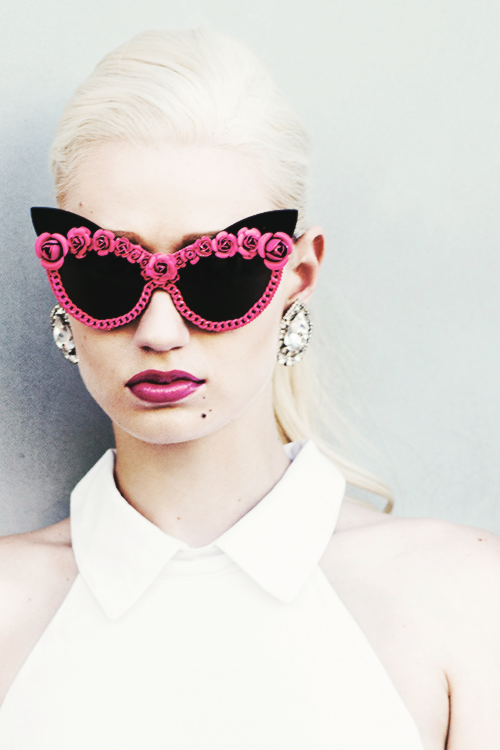 I'm harboring a J-Law-level girl crush on Iggy, and you should too. 1. Because she isn't afraid to speak her mind. 2. Because those earrings probably weigh five pounds. And she is pulling. them. off. 3. Because she's a bit of a magpie. 4. Because one time she wore an oxblood fur shrug to shimmy in front of a semi-truck. I can't even wrap my head around this ensemble. And if you haven't seen the video for Work, WATCH. IT. NOW. 5. Because of the time she casually wore butterflies on her face. 11. Because she's highly GIF-able. I'm sorry, what was I saying? I was staring at this GIF for like two hours. 12. Because this is how she rides in a car. 13. Because she can whip her hair back and forth. 14. Because she laughs in the face of practical footwear. 15. Because of her absurd taste in sunglasses. 16. Because of the time she took her jewelry cues from '90s Versace. 17. Because of this American Beauty reference. 18. Because she is the undisputed queen of hair extensions. 19. ...and those hair extensions have rendered shirts unnecessary. 20. And oh yeah, last but not least, because she's CRAZY TALENTED. Case in point: her video for Murda Business is Toddlers & Tiaras-themed. Please and thank you.